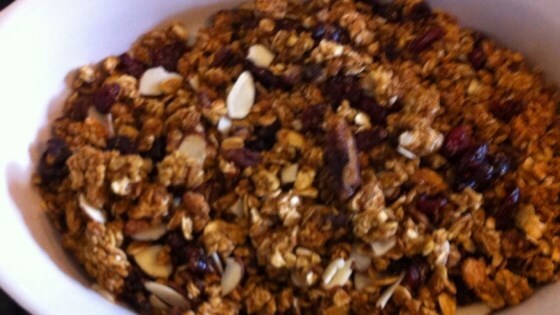 "I'm a huge fan of crunchy granola breakfast cereals, but wanted to make my own so I could change it up now and again. Makes a great addition to yogurt or topping for ice cream." Preheat oven to 275 degrees F (135 degrees C). Line baking sheets with parchment paper. Mix rolled oats, flax seed meal, steel-cut oats, oat bran, wheat germ, and pecans in a large bowl. Whisk agave nectar, pumpkin, brown sugar, water, canola oil, vanilla extract, pumpkin pie spice, and sea salt in a separate bowl, stirring until brown sugar and salt are dissolved. Pour liquid ingredients over rolled oats mixture and stir to coat. Spread mixture on prepared baking sheets. Bake in the preheated oven for 1 hour, stirring every 20 minutes. Stir dates into granola and continue baking until granola is lightly golden brown, 20 to 30 more minutes, stirring once. Let cool completely and mix miniature chocolate chips into granola. Store in an airtight container. Edible containers of baked granola for yogurt and berries. Flax seeds release their nutritional content after you grind them to meal, and I used a small coffee bean grinder to do this. 1/4 cup of flax seeds will yield approximately 1/2 cup of meal. You won't taste the pumpkin flavor; it adds necessary liquid and extra nutritional value. You could use oil or apple sauce alternatively, but if you do, omit the 2 tablespoons canola oil since oil and apple sauce contribute more liquid than canned pumpkin. Mini chocolate chips are added for the sake of my kids and can easily be omitted. You could also add 4 packets of the mini marshmallows that come with prepared hot chocolate mixes. Try applesauce and apple pie spice for slightly different flavor or different nuts, various dried fruits, coconut or whatever you have in the pantry. Add the nuts at the beginning so they get nice and toasted, dried fruits after the first hour.